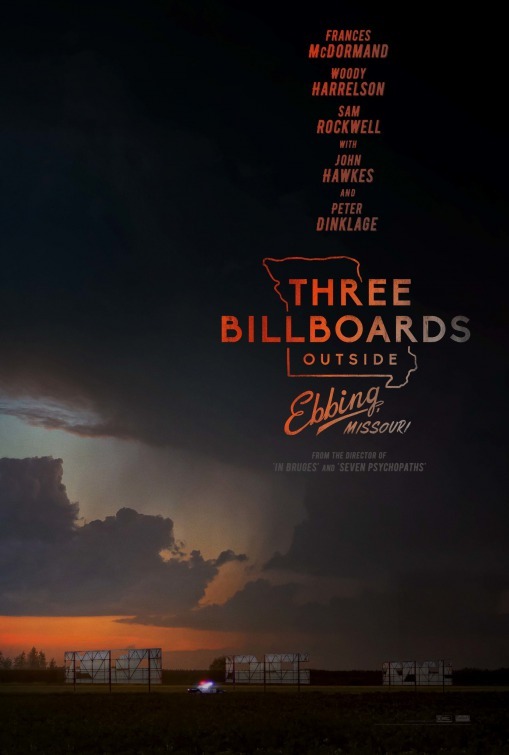 Chrichton's World: Review Three Billboards Outside Ebbing, Missouri (2017): I was completely immersed then the ending happens! 6 Underrated horror movies from the 80' s! Review Three Billboards Outside Ebbing, Missouri (2017): I was completely immersed then the ending happens! Three Billboards... starts outs as advertised with a light comedic approach to a serious topics like crime, sickness, grief and more. But then twists and turns in surprising ways that makes you root and question characters at the same time. Even to the point it gets dark and twisted. Now I do have to remark that this film is a black comedy more than it's a crime drama. Meaning that a lot of reality is thrown out the door and that crime solving and everything tied to it isn't that important in this film. It's more about the characters and how they evolve through the events that has put them together. There aren't many films that give you character development to this extent. Although it has to be said that the characters aren't nearly as fleshed out as they could and should have. However the performances will make you overlook that since they are phenomenal. The Oscars for Sam Rockwell and Frances McDormand are well deserved if you ask me. Especially in case of Sam Rockwell. His character Dixon is the one who has the biggest transformation in the film. He was on a path of evil and destruction but then gets set straight by the words of his late Chief Willoughby (Woody Harrelson). All Mildred (Frances McDormand) wants is for the police to solve the case of her raped and murdered daughter. Out of desperation and frustration she feels compelled to put up these billboards to remind them of it. And a lot of people are against this action. Why? My guess is that they want to move on and forget it happened. Or worse they simply don't care. Still if that were true then why do some of the people go ballistic. Is it that they have something to hide? More questions pop up but not one of them get answered. It's up to you what to make of it although writer / director Martin McDonagh makes it clear where his sympathies lie. Or at least I thought so. The ending gives us a twist on the morality of the characters and contradicts the tone of the entire film prior to it. I am not sure what to make of it. For me it ruined the characters I was liking or started to like. Why would you do this? All this time we already learned here and there that there was more to these characters and that they would learn from their mistakes. Not the case in the ending. Why would this film make me go on this journey with them to then say don't mind them they are a bunch of idiots. The film had the potential to end on a good and positive note but felt like becoming dark just for the sake of it. And not because of the reason you think. I was on board for these characters to get in touch with reality and move on with their lives. I actually liked it that Dixon got inspired. But to then go against all the development they had acquired? Why ? Overall I truly enjoyed Three Billboards... but that ending almost ruined it for me. Fortunately it did not detract enough from the many strong moments in the film. Comedy, drama and relentless darkness all in one film. You got to hand it to Martin McDonagh it's quite an accomplishment. However that doesn't excuse him from the huge mistreatment of his main characters at the end. Still like I said the performances were phenomenal. And I can recommend this film for that alone. Review Prooi a.k.a. Prey (2016): An enjoyable monster movie if you can get past the bad CGI! Review The Skin I Live In a.k.a. La piel que habito (2011): A masterful Antonio Banderas! Review Naked Killer (1992): A Wong Jing written and produced cult classic. That should tell you enough! Review Mimic: The Director's Cut (1997): Atmospheric horror done right! Review Friday the 13th Part VII: The New Blood (1988): Jason versus Tina. Tina? Who is Tina? Exactly! Red light blinking Wiko Sunset 2 (and other Smartphones) / Solution / It might not be the battery as often suggested! Review The Dictator (2012): Better than Brüno but far off from Borat and Ali G! Review Intruders a.k.a. Intrusos (2011): Heavily flawed but very much worth your time! Review The Sweeney (2012): You're nicked! Review The Expatriate (2012): Dad Eckhart is a saint for putting up with his annoying daughter! Review Red Lights (2012): Absolutely worth your time! Join us for free and get valuable content delivered right through your inbox.